Dr. Donovan earned his degree with Honors from the University of Florida (Go Gators!). 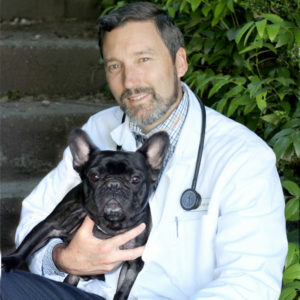 His veterinary interests include soft-tissue surgery, endocrinology, epidemiology, and zoonotic diseases. He has one pet – a French bulldog named Wilson. Dr. Donovan enjoys spending time with his wife and two daughters, hiking and backpacking, snowboarding, playing tennis, gardening, going to Mariners games, and reading.